Homeowners love their backyards, in fact, in the most recent 2018 Houzz survey 88 percent of homeowners surveyed were updating their outdoor living elements, including lounge furniture, fire pits, string lights and even outdoor entertainment elements like wired or wireless speakers. As homeowners, our backyards are more of an outdoor living space and playground for both adults and their kids. How does insurance cover all these upgrades that new homeowners might be considering when they buy their first home, or when you want to do an update to your backyard and make it a more comfortable living space? Home insurance might have special policy limitations on outdoor toys, or special needs for insurance on swimming pools, hot tubs, and landscaping. We're going to cover all the basics of insuring your outdoor playground, to help you get the most out of your home insurance and make sure your pools, outdoor furniture, and backyard upgrades are insured properly. What Kinds Back Yard Items Do You Need to Tell Your Insurance About? If the value is more than a few thousand dollars, you will want to make sure that you have enough coverage for the additions you are making to your property. Also be sure and ask what perils your backyard items are insured for. Some policies may not insure damage due to wind and hail, while others might. These become important factors in choosing the right home insurance when you've invested money into an outdoor living area or entertaining space. In many of the items we discuss below, the coverages may vary based on the type of item. Be sure and ask if the insurance you have is for replacement cost or actual cash value. What Backyard Items Need Extra Liability Insurance? If you have any of the following items in your backyard or on your property, there may be greater liability risks than with a home without these items. In addition, they may or may not be covered depending if they are considered additional structure, detached, or attached, or external structures. Read more about this in the sections below. Any other item that increases the risk of injury on your property. If in doubt, contact your insurance company and they can help you make sure you have enough coverage. Some insurance companies have strict guidelines on some of these items and may require additional liability, or have restrictions on certain items like trampolines, slides or diving boards. It is really important to find out if your home coverage will still be valid once you've added these items. A personal umbrella liability policy is also a good idea to supplement your insurance for a very reasonable cost. Learn more about personal umbrella liability here. What Kind Of Insurance Do You Need For Pools and Hot Tubs? Normally when following the regulations you may be in line with what the insurance company will require, however, it can happen that based on the insurance company underwriting they may require additional safety features or precautions. Always contact your insurance company to let them know about your plans and get guidance. Is There Coverage for a Pool on Home Insurance? Home insurance policies may cover an in-ground pool automatically under the structures or they may require an additional endorsement to be added to the policy in order to cover the pool. Some home insurance companies consider above-ground pools personal property and others require you to add an endorsement for the above ground pool. Contact your home insurance to understand the coverage available to you. What kind of coverage is included in the policy and can you add an endorsement to add better protection for physical damage to the pool, spa or hot tub? Can you increase your liability limit on your home policy? Is it okay to have a diving board or slide? Are there any criteria around these items or exclusions? What exclusions are there? Is the coverage on the pool, hot tub or spa open perils or named perils? What kind of fence do I need? Are there any specific criteria to height or distance between fence posts? Does the fence need to be self-closing, or have self-latching gates? Does it need to be covered or locked when not in use? Are there special requirements for suction drain covers in pools or spas to prevent suction entrapment? Some insurance companies will not insure or will exclude pools with slides and diving boards, always ask first to make sure your insurance company will cover you. Additional structures are covered under a homeowner policy as a percentage of the building amount. Items attached to the home such as a deck, should be considered as part of the reconstruction cost of your home. If you are adding structures to your property, or adding extensions or items that are attached to the home such as large decks for entertaining, or outdoor living, you should always contact your home insurance company and make sure the limits for your additional structures are going to be enough to cover your property. Is Landscaping Covered on Home Insurance? The coverage terms for landscaping differ between home insurers, but in general you may have some basic protection up to a certain limit of the insured value of your home. For example, a common limit is a value of 5 percent of your insured dwelling (building) value, with a limitation per item. The limitation per item can be around $500 per tree, bush or shrub, for example. If this isn't enough, you may be able to ask for an endorsement on your home insurance policy to increase the limit per item. There are many policies that have potential for higher limits on landscaping but you will only know if you check your policy wording or ask your insurance representative. Home insurance is really something that should be selected based on your lifestyle needs. This article reviews some differences between different types of home insurance policies. 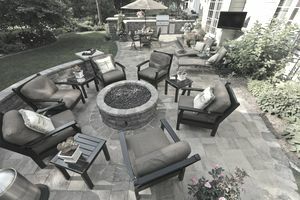 How Are Patio Furniture, Yard Entertainment Systems or Outdoor Decor Covered on Insurance? The movable items in your backyard such as furniture, BBQ's and other decor form part of the contents of your home insurance. You can check the contents coverage on the declaration page of your home insurance policy. If you have made a significant investment in special items, it is always a good idea to call your insurance company and ask them if you require any additional coverage since the policy wording for each company is different, and your understanding of the "contents" of your home may not always line up with the insurer's definition in the policy. Also keep in mind some companies may limit what these items are insured against, so be sure and ask what the exclusions and limitations are on your policy regarding outdoor items. In most cases everything will line up, but it is always best to ask to protect yourself, especially when you are investing in what you have outdoors.